Way back when in my high school days, I would visually take into account a selection of restaurants I would want to try in the future (yes, it started early). Of course, some of them were out of my price range, so that would be much later. 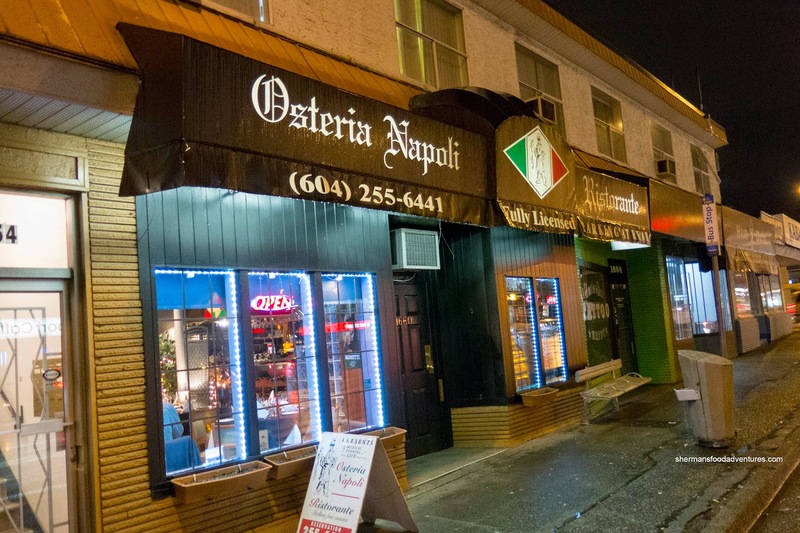 One of which was Osteria Napoli situated on Renfrew at 1st. Fast-forward many years later and by virtue of a Groupon, Viv and I finally got to visit the place. Good thing too because the place is pretty ol' skool, not sure if we necessarily fit the age group back then. After we were seated, we really appreciated the genuine and attentive service from the staff. 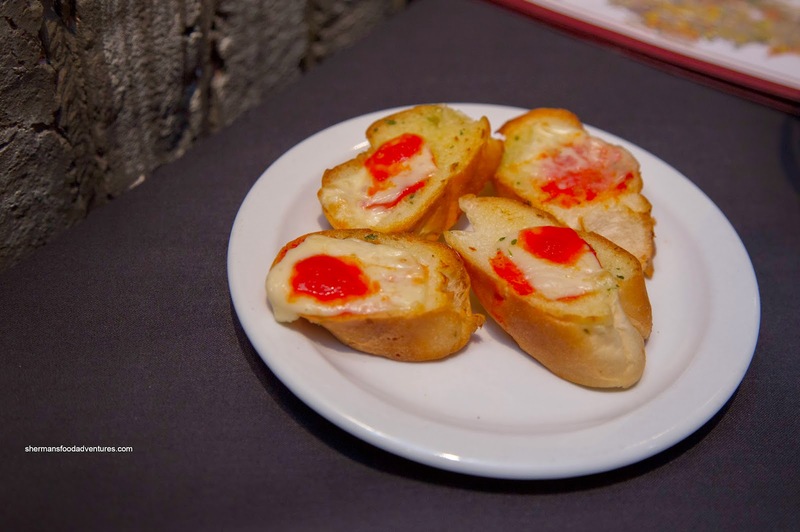 Interestingly, we not only served bread to start, we also were presented with some Crostinis topped with melted mozzarella and a dab of tomato sauce. Light and crispy, these crostinis benefited from the nice acidic tang from the sauce. Looking over the menu, we were confused why the Large Caesar Salad was only a dollar more than the small. So being the deal-hunting Asians that we are, we went for the large. 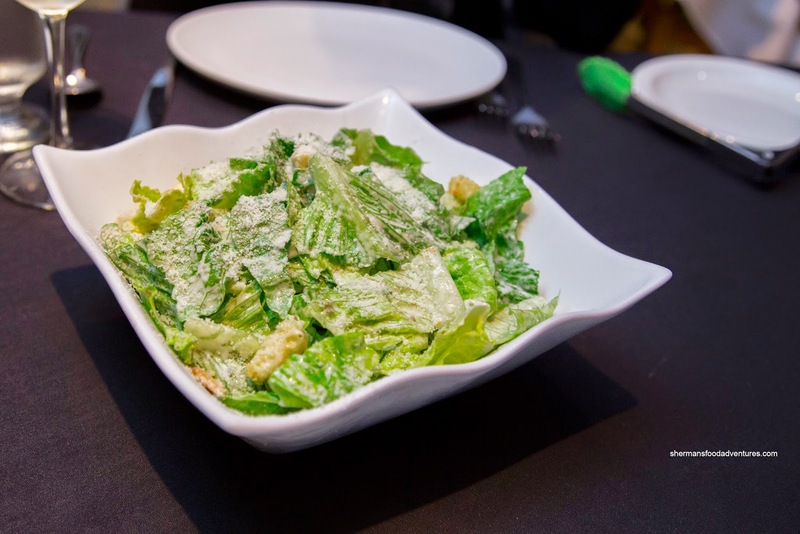 Crisp and bright, the Romaine was dressed just enough that there wasn't a pool of dressing on the bottom. It was rather mild though with a creaminess accented by the Parmesan. We would've liked to see a bit more acidity and saltiness though. Moving onto some pastas, we had the Linguine alla Vongole in a white wine sauce and the Spaghetti alla Calabrese with Italian sausage. Although a touch soft and saucy, the linguine was full of briny clam flavour. 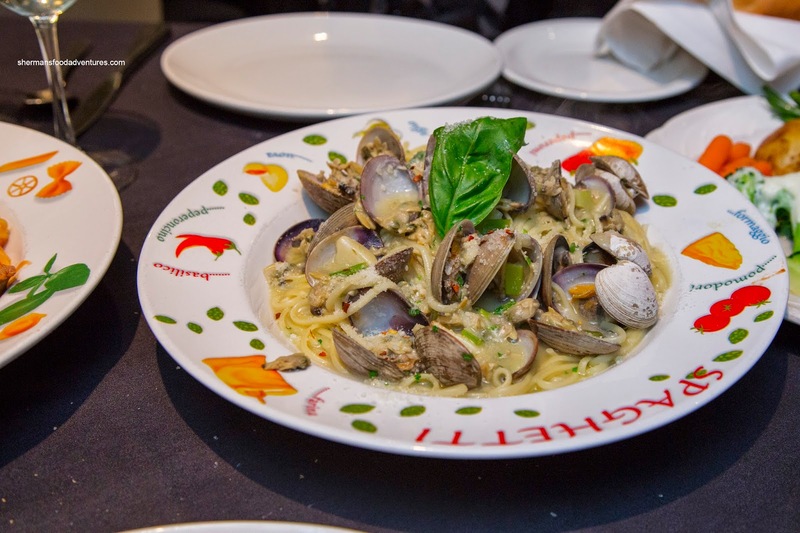 It benefited from the generous amount of canned baby clams and fresh-in-the-shell Manilla clams. We felt there was a good balance of properly cooked-down white wine and seasoning. As for the spaghetti, it was nicely toothsome and slightly thick. The chunky tomato sauce exhibited an appealing tang offset by a muted sweetness. 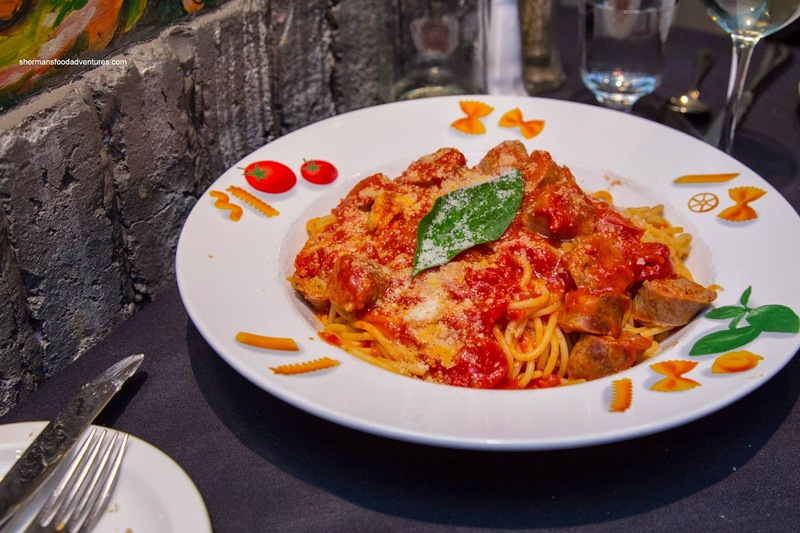 We didn't notice much heat from the sauce, rather it came from the meaty and ample Italian sausage. 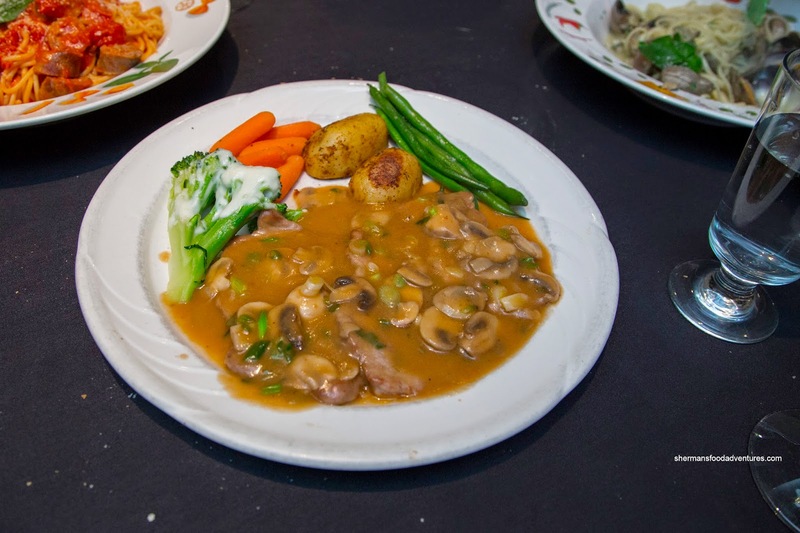 Lastly and to our server's surprise, we also had the Veal alla L'Osteria with white wine sauce, mushroom and shallots. Lightly floured, tender and meaty, the thin veal slices were nicely prepared. We found that the overabundance of sauce was not necessary though. It was thick with a hint of wine, but in need of some salt. The side of veggies were still vibrant and crunchy except for the salty soft carrots. Of course the potato was not crunchy, rather it was soft without being mushy. After it was all said and done, we were a bit on the fence about the place. It is true that the food will not exactly knock your socks off, but it was okay. Definitely a bit more ol' skool, possibly in need of some modernization. Foods look totally old school, just as I remembered it the last time I was there (late '90s ?). Maybe that's not such a bad thing ..... nowadays it seems most restaurants' foods come in 'small' or 'sharing' plates that look like itsy bitsies of food left on plates that the kitchens forgot to wash.